The HFE Gene codes a protein involved in iron absorption and causes the body to take in excess iron from food and water. Hereditary hemochromatosis is a genetic condition in which people absorb too much iron from their diet. While iron is good for you in the proper amounts, Hemochromatosis is the result of too much absorption of iron. Eventually, this increased iron absorption leads to iron overload. There are several types of hemochromatosis, but type 1 hemochromatosis is the most common. Type 1 hemochromatosis is also commonly referred to as hereditary hemochromatosis or genetic hemochromatosis. When we have hereditary hemochromatosis our DNA changes and mutates. Normally, iron metabolism is an extremely tightly controlled system. Even slight elevations in iron above and beyond what the body uses or needs sends signals to decrease the uptake and absorption of dietary iron. With hemochromatosis, it is like the body always thinks it is deficient in iron. Learn about Symptoms of Hereditary Hemochromatosis. What Causes Type 1 Hemochromatosis? 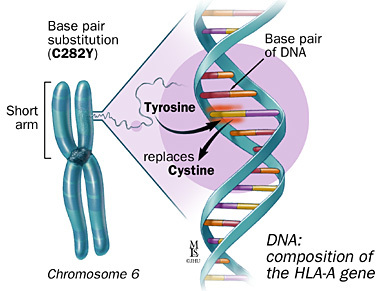 Type 1 Hereditary Hemochromatosis results from a genetic mutation to the HFE Gene on Chromosome 6 and may involve the C282Y, H63D, or S65C alleles. Genes are made of DNA, and serve as a set of instructions for how the body makes certain proteins and carries out many important functions. An allele is a form of a gene that has a slightly different DNA sequence. While these differences contribute to a person’s individual features (like eye color, height, etc), an allele can also reflect a genetic mutation. A genetic mutation is a permanent change in DNA sequence. A hereditary gene mutation is inherited from one, or both, parents. The DNA is permanently changed, and will be present for a person’s entire life. Likewise, this genetic mutation can be passed down to the next generation, and so on. This is what we see from the hereditary hemochromatosis gene, known as HFE. The HFE Gene codes a protein involved in iron absorption and causes the body to take in excess iron from food and water. In normal iron metabolism, this gene helps to control and regulate how much iron is absorbed into our system. 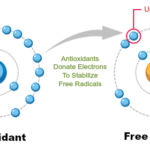 There is a feedback loop that eventually tells the body to stop absorbing iron once it has enough. However, in hemochromatosis, the HFE mutations cause a signal that continually and perpetually tells the digestive system to absorb iron from our food. It’s like there’s no “off switch”. 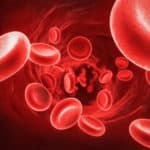 Over time, this gene mutation leads to iron overload. The naming of the hemochromatosis gene “HFE” stands for “High Iron”. Fe is Iron’s chemical symbol, so when you put the H with the FE… you get the HFE Gene. Certainly, when a person’s genetic profile possesses 2 mutations of the HFE gene (as described above) their health is at very serious risk from iron overload. Without a doubt, the most severe cases of hemochromatosis are the result of these genetics. Additionally, the numbers tell us that 1 in 9 individuals of Northern European descent are carriers of one HFE gene. This means that having a single hemochromatosis gene is very common! Another important point is that we should not dismiss the impact that one single hemochromatosis gene mutation can have upon our health. Even one missense copy of C282Y can lead to a degree of iron overload in some individuals. This scenario can absolutely be an underlying cause of health challenges, symptoms, illness, or disease for a number of people. Many doctors, lab testing companies, books, and other websites tend to “down-play” the potential health consequences of having only one hemochromatosis gene. You may read or hear that one missense copy is not “clinically relevant”. To me, this seems to ignore the stories and symptoms of people whose health have been compromised by a moderate level of iron overload. Many individuals from around the world have written me and told me about their health challenges due to high iron… even though they “only” have one gene mutation. Likewise, I have heard numerous stories from people who did not understand their potential health risk or the implications of storing too much iron. I have seen countless cases in which individuals were told their health was fine, or that it was “all in their head”. Perhaps worst is when a person is told by a doctor that they have a hemochromatosis gene, but that they do not need to do anything about it, because they only have one mutation. I have even heard of stories where people were discouraged to donate blood, even a single time, even with elevated ferritin! My guess is that many healthcare practitioners just do not think about hemochromatosis or they may not even know about hemochromatosis. Fortunately for those with Hereditary Hemochromatosis who would like to “do something about it”, we are here to help! My point is: why wait to see if you develop “clinically relevant” symptoms? If hemochromatosis is identified early and treatment like therapeutic phlebotomy is effective and well tolerated, then symptoms and disease is potentially entirely preventable! There are so many positives that can come from addressing Hereditary Hemochromatosis in a safe and effective manner. Additionally, the steps taken to approach hemochromatosis benefit our overall health– it’s another win-win! Personally, I have only 1 copy of the HFE gene and I express symptoms of iron overload. I am very fortunate to have started caring for myself at a young age. I know that I am doing what I need to do to have a long, happy, and healthy life. Researchers are currently investigating the effect a mutation in the HFE Gene has upon the substances Hepcidin and Ferroportin, both critical molecules that regulate the uptake, absorption, and deposition of iron in the body. We aim to keep you updated on hemochromatosis studies as they emerge.